Pony Fun. San Francisco Style. Bay Area Brony Spectacular (aka BABSCon) is the San Francisco Bay Area's My Little Pony (MLP) fan convention. It was founded in 2013 and had its first event in April of 2014 with record-setting attendance. That first con was the largest ever for a first-year MLP convention and immediately made BABSCon one of the largest MLP cons in the world. Every year we offer four (4) days of pony filled fun for families, Bronies, and fans of all ages inside the SFO Hyatt Regency in Burlingame, CA. BABSCon brings together actors, writers, artists, and staff from the My Little Pony: Friendship is Magic cartoon & IDW comic series; as well as community podcasters, YouTubers, artists & writers. Talented musicians from around the fandom perform for our NEIGHhem concert; and MLP fans like you come to host panels, workshops & events, video & table top gaming and competitions, and so much more! In addition to all of the above, BABSCon has programming dedicated exclusively to the youngest attendees! BABSCon celebrates not only a wonderful world of pastel ponies but the friendship and community that inspires us all. Please explore our site to learn more about BABSCon and the fun we have in store and check out the MENU at the top right to find exactly what you're looking for. Announcing 2019 Charities to benefit from BABSCon's 6th Charity Auction! Jack in, console cowpokes, 'cuz we're twenty minutes into the future. BABSCon is about to begin, so deck your avatar out in your finest swag and let's hack the Gibson. But first, you need to know a few things! 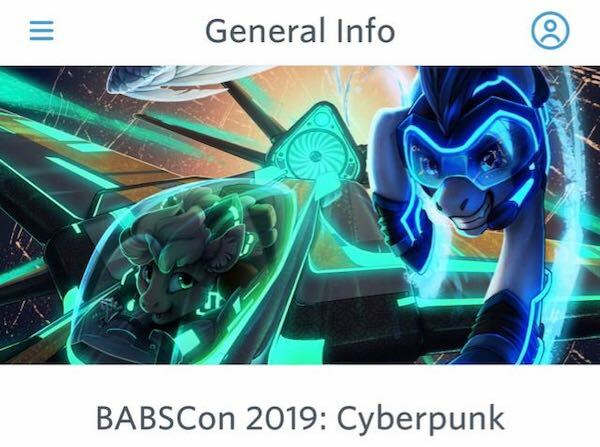 BABSCon 2019 is on Guidebook! Download the Guidebook app onto your iOS or Android mobile device, or just browse it on the web to get all...Click to Read More. Join instructor Solid, a certified 3rd generation Jeet Kune Do practitioner, in a “hooves on” workshop introducing some of the moves and philosophy behind the practice. Welcome special guests representing skills from their own respective traditions, Fire Wing (Shaolin Kenpo) and Professor Smiley (Wing Chun). This special ticketed event will be...Click to Read More. 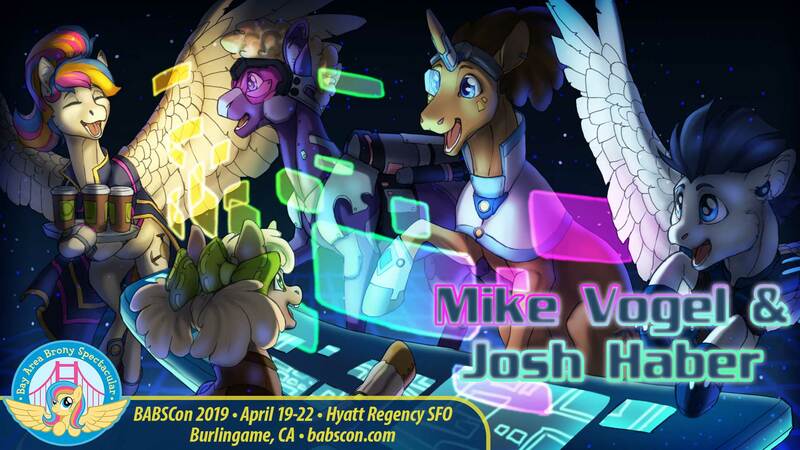 Last-Minute Plot Twist: BABSCon Books Mike Vogel and Josh Haber! Well, well, well…looks like we decided to make our last Guest of Honor announcement for BABSCon 2019 a juicy one! Two giants of MLP storytelling will be gracing us with their presence: Mike Vogel and Josh Haber. Mike, once Hasbro’s VP of Development, had an epiphany during a visit to Burning Man that he wanted to be a creative again, so he...Click to Read More. Discover the fun and excitement of BABSCon today! Click the topics below to learn more. Every year BABSCon invites Voice Actors, Directors, Artists, Writers & others from the staff of the Friendship is Magic cartoon and comic series! Each year, BABSCon brings you four (4) packed days of panels, workshops, meet & greets, fan projects, and some stuff we can’t even begin to spoil! Come see the Brony Fandom’s all around #horsefamous gather at BABSCon to show off their projects, teach, and party like they’re at a Pony Party! Saturday night has the house full of bass pumping sounds as the Brony Fandom’s best musicians rock out in our annual NEIGHhem Concert! Golden Gates & company come to life and walk among us to uphold friendship, fend off Queen Quake, & continue to write the Legends of BABSCon! So big it spans two (2) halls, our vendor area is a massive, carefully curated selection of the fandom's finest wares, art, plushies, clothing & more! Without these generous individuals, BABSCon would not be what it is today!